JSON and XML has been supported natively by kbmMW for years. Later kbmMW also supported marshalling of native Delphi objects to and from JSON and XML. In addition to it being a very nice way to stream Delphi objects, the feature also allowed for a way to convert XML to JSON and visa versa. However, the upcoming version of kbmMW now includes a new object notation framework, that makes it easy to convert from one notation to another, without going through a native Delphi object. 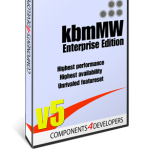 The new version of kbmMW not only supports JSON and XML, but now also YAML (which is a more human readable format) and the compact binary Messagepack and BSON formats, natively, both for creating your own object notation trees in code, and for marshalling Delphi objects to and from. With the many new object notation formats supported by kbmMW, it also made sense to find a way to make it easy to convert between them, without having to marshal to and from native Delphi objects. In addition a number of abstract stream classes was developed, which purpose is to handle converting the object notation trees to and from various string or binary formats, and a set of abstract classes that handles marshalling object notation trees to and from native Delphi objects. JSON, YAML, BSON and Messagepack object notation classes directly descends from the Object Notation classes. 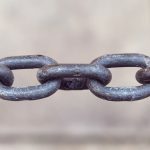 Since XML is a more rich notation format, it was decided to leave its SAX based parser (which the XML DOM class use) and instead add support for converting the XML DOM tree to and from the Object Notation format. This way its easy to convert between different notation formats, without sacrificing the more advanced features of our native XML parser. The above specialized object notation classes, are in reality very very slim. Thus the underlying TkbmMWON…. classes are sufficient for conversion. So even if one build a JSON object notation tree in code, it can still be understood by the Messagepack formatter code etc. Generally it’s recommended using the non specialized classes instead of the specialized ones for simplicity reasons. // into, to get information about what type fails etc. // s now contains the serialized object in JSON format. // s now contains the serialized object in YAML format. BSON and Messagepack follows the same pattern as JSON and YAML. // s now contains the serialized object in XML format. The Object Notation classes also supports letting the developer indicate if a property key/value pair of type TkbmMWONNative should be streamed as an attribute or an element in XML. 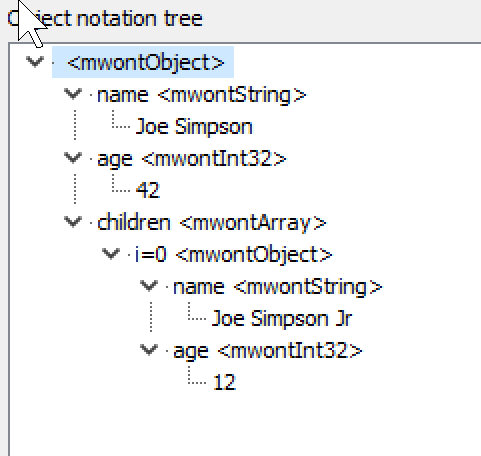 Further the TkbmMWONNative class supports custom values, like the BSON Decimal128 value. As no other streamers understand that value type, using custom types do limit lossless conversion between different object notation formats. 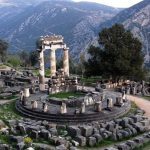 Delphi native objects can be marshalled to and from the Object Notation format, and thus also to and from the above supported specialized object notation formats formats.